A new plan by the Trump administration to penalize legal immigrants if they use certain public benefits is causing widespread concern among Bay Area health and social service providers, who say the proposed rule is already compelling nervous immigrant parents to skip health and nutrition programs for their U.S. citizen children. If the rule is implemented, the ripple effects could be felt among hundreds of thousands of people in the Bay Area, according to a new analysis by the Migration Policy Institute, a non-partisan think tank in Washington, D.C., that was prepared for the Silicon Valley Community Foundation. Under the Trump administration’s so-called “public charge” proposal, non-citizens in the U.S. on temporary visas would have a tougher road qualifying for green cards — and eventually U.S. citizenship — if they use Medi-Cal, food stamps, Section 8 housing vouchers and other taxpayer-funded benefits. Officials with the U.S. Department of Homeland Security say the changes are needed to protect American taxpayers. The 447-page plan notes that the use of public benefits by U.S. citizen children should not hurt an immigrant parent’s application for a green card, or lawful permanent residence. Still, families are already dropping out of programs, even those that are not targeted by the draft rule, such as subsidies for school lunches, said Anna Dyer, director of services at the Second Harvest Food Bank in Santa Clara and San Mateo counties. 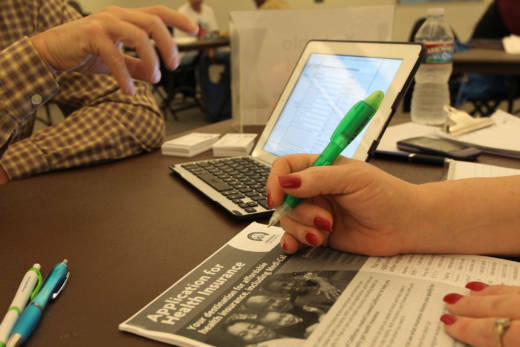 The public charge rule could trigger a big disenrollment from safety net programs that health and social service providers in California have worked for years to promote, said Michael Fix, a researcher with the Migration Policy Institute. Fix believes the reaction among immigrants could be similar to what happened after the passage of the 1996 welfare reform act. Fix estimates only about 26,000 non-citizens in the Bay Area today depend on the government for cash assistance — Supplemental Security Income and Temporary Assistance for Needy Families — and could currently be considered a public charge by immigration officials. But if the federal government expands the public charge test to Medi-Cal and food stamp users, thousands more immigrants could face difficulty if they apply for a green card. And uncertainty could lead as many as one million people in the region to consider abandoning programs they are eligible for, said Fix. “What we're talking about here is people who live in family situations that would be likely to feel the kind of chilling effects we saw with the 1996 law,” said Fix, who presented his findings at a meeting of dozens of county workers and non-profit service providers this week in San Mateo. The proposed changes aim to “promote immigrant self-sufficiency and protect finite resources by ensuring that they are not likely to become burdens on American taxpayers," said Homeland Security Secretary Kirstjen Nielsen in a statement. But that reasoning doesn’t make sense to Hope Nakamura, an attorney who runs the public benefits practice at the Legal Aid Society of San Mateo County. “These support programs that they’re trying to add to the public charge roll actually help families in the long run become self-sufficient,” Nakamura said. The public can weigh in on the proposed rule until Dec. 10. Already, 46,200 comments have been submitted. Unauthorized immigrants are not eligible for most taxpayer-funded benefits.